This is my favorite go to recipe for when I have a chocolate craving that will just not go away. 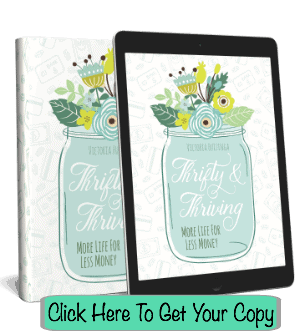 It uses simple ingredients and takes under 5 minutes to make. You can adapt the add ins to suit your tastes. This recipe also makes a great gift. 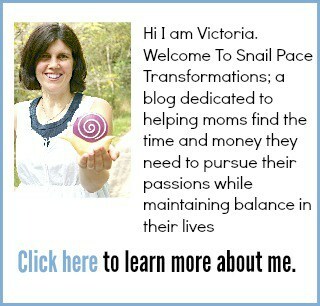 I like to place it in a see through gift bag and tie with a ribbon. 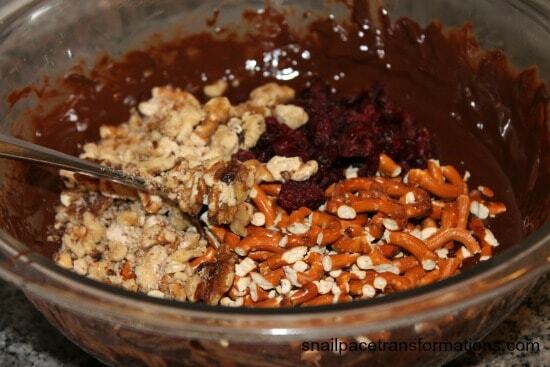 Other add in ideas include, crushed oreos, pretzels, peanuts, almonds, dried cherries, dried blueberries, dried apricots, crushed peppermints the ideas are endless, just dig around in your cupboards and see what you can find that sounds good covered in chocolate. First place the chocolate chips in a microwave safe bowl. Place the two tablespoons of coconut oil on top. Heat for one minute, take out and stir, heat for another minute take out and stir, heat one more minute, take out and stir (repeat 30 seconds more if needed). You should end up with a very smooth chocolate, which by the way you could use to dip marshmallows, or truffles or strawberries in. 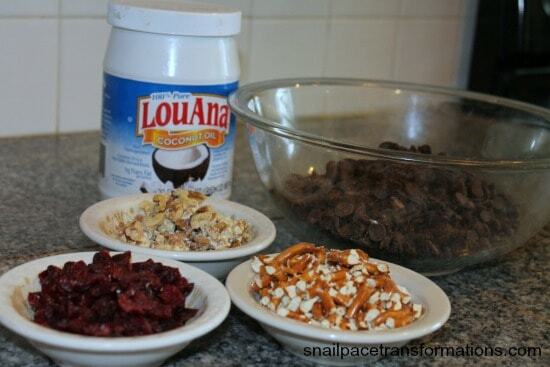 But, right now we are making chocolate bark, so go ahead and dump in all you add ins. Now grab a cookie sheet and lightly grease it. I use the one from my old toaster oven. You can use a normal size pan just don’t spread the chocolate out as far. Smooth some wax paper on top. 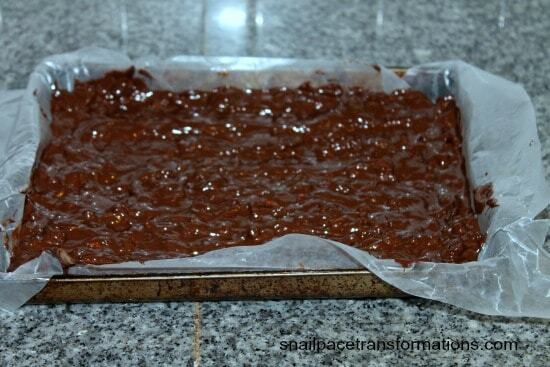 I find the grease keeps the wax paper from moving around when I am smoothing out the chocolate. 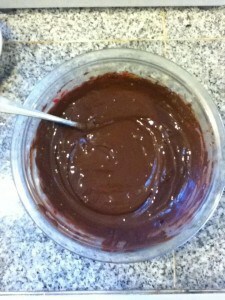 Spread out the chocolate to the edges of the pan. Please note, once again I use a toaster oven sized pan, if you are using a normal sized cookie sheet you need to spread it out till it covers about half the surface of the pan. Place the pan into either the fridge or freezer for about one hour. Then peel the wax paper off the back, and break into pieces. 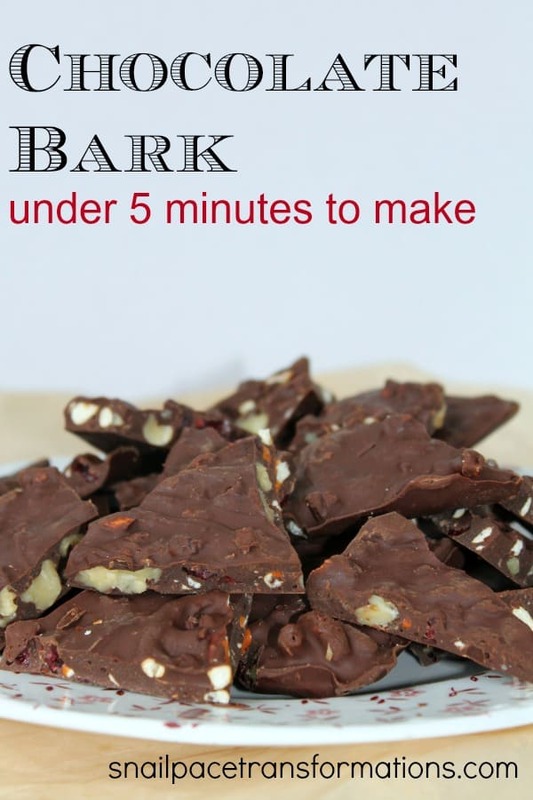 You will end up with enough chocolate bark to fill a cookie tin, or several treat bags. place in microwave another 30 seconds if needed, you should have smooth chocolate. pour out onto a lined and lightly greased pan. break it up and serve.